Courtyard Cottage01873 830219work01873 830219fax Self-cateringHopyard Farm offers Courtyard Cottage the perfect accommodation for groups up to 14 people. Surrounded by the beautiful Brecon Beacons and Black Mountains the farm is located in the picturesque Usk Valley between the River Usk and Monmouthshire-Brecon Canal. Renovated from a stone barn Courtyard Cottage sleeps 14 in 6 bedrooms. Original oak beams and exposed stone work give this cottage real character and complement the 21st Century essentials of fully-equipped kitchen/diner, under floor heating, large screen TV and DVD and four bathrooms (2 ensuite). Large lawned area provides a safe children's play area with slide and swings plus garden seating for guests to enjoy the stunning views. We offer a gas barbecue for hire and a range of games for guests to use from reception. Our big indoor games room perfect for the 'bigger kids' with snooker, pool, football tables and table tennis. Courtyard Cottage at Hopyard Farm. Sleeps 14. Courtyard Cottage perfect for groups of friends and family. 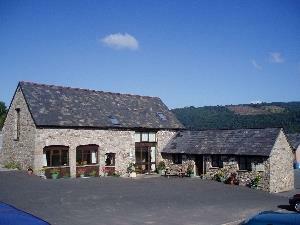 Located in the Brecon Beacons and only 3 miles from the market town of Abergavenny. Hopyard Farm offers Courtyard Cottage the perfect accommodation for groups up to 14 people. Surrounded by the beautiful Brecon Beacons and Black Mountains the farm is located in the picturesque Usk Valley between the River Usk and Monmouthshire-Brecon Canal. We have a comprehensive range of bikes to suit the whole of the family which can be hired from the farm. Close to traffic free trails on the nearby canal and old railway line, there are close links to national and regional cycle routes as well as mountain biking in the Brecon Beacons. The bustling market town of Abergavenny is only three miles from Hopyard Farm, much closer is the village of Govilon, which has a general store, two public houses, Post Office and Church. From Abergavenny travel along A465 (approx 3 miles) to large roundabout. Take the last exit -signed as Dead End Lane but also Glanbaiden. Follow road past 2 houses and take first left turn. Farm infront of you - drive in to Courtyard. Local bus route in the village of Govilon.